Palm Tungsten Based Bird Encyclopedia | OhGizmo! By Andrew Liszewski on 03/13/07 • Leave a comment! The ‘Audio Visual Handheld Bird Encyclopedia’ from Hammacher Schlemmer crams a wealth of birding data into a small package. In reality it’s just a Palm Tungsten PDA running the National Geographic Society’s birding software but it can replace a backpack full of field guides and notebooks. The software has a database of 867 North American birds, 1,600 bird images, 650 range maps and four hours of recorded birdsongs from the Macaulay Library at the Cornell Lab of Ornithology. I assume since they’re dropping that name the lab is well respected amongst the birding community. Besides allowing you to search the database by name, color, size and location the software also includes a checklist feature since keeping track of what birds you’ve seen is important for earning street cred as a bird watcher. Your checklist can even be uploaded to eBird.org providing others with information about when and where you had your sighting. The Audio Visual Handheld Bird Encyclopedia is available from Hammacher Schlemmer for $449.95. 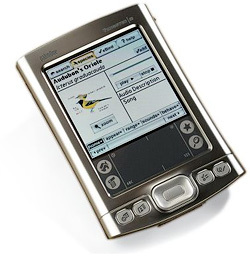 However if you’re already running a Palm device you can simply order the software for $199.95.